It's been quite a week for president Soetoro. He's washed his hands of the Healthcare.gov website debacle by claiming that he didn't know anything about anything at any time - which is, sadly, an entirely believable assertion. Frankly, we're surprised that he didn't try to kill two birds with one stone by claiming the person in charge of supervising the Healthcare.gov website had been Ambassador Chris Stevens. Then again, he still may. This week, Barry's policies and persona were also instrumental in Saudi Arabia's discontinuation of diplomatic relations with the United States, owing to their belief that Barry has made a complete and explosive mess of the Middle East (with Syria not even getting spanked for using chemical weapons on civilians, and Iran happily assembling nukes on Henry Ford-style assembly lines while John Kerry takes Balinese dance lessons). And the president's foreign policy failures weren't limited to the Middle East; soon-to-be-former allies France and Germany are now honked off after discovering that Barry had the NSA spy on their phonecalls, perhaps under the suspicion that those nations might be harboring members of the Tea Party. All of which would make for a satisfying week's accomplishments for an ordinary America-hating socialist. But Barry isn't one to rest on his haunches (or Reggie Love's) when there's still damage to be done. Which is why on Thursday, he told Congress that he wants a final immigration overhaul by the end of the year, in order to make American citizenship completely meaningless once and for all. Okay, he didn't say that last part out loud, but trust us - it's what he's thinking. At least when he's not thinking of golf. There's really only one thing which keeps this week from being absolutely perfect for B. Hussein - and that's the fact that more and more people are starting to see him for the duplicitous little crapweasel that he truly is. Unfortunately, it's the United States and her citizenry which will be paying the cost of Barry's rapidly failing credibility and moral failures for the next 3 years as it becomes nearly impossible for legislators or allies to repair any of the damage he's done to our country and the world at large. If you find all of this depressing, don't lose hope: Obamacare now requires everyone to have insurance coverage which covers mental health. So primal scream therapy and prozac will be available and affordable for all! 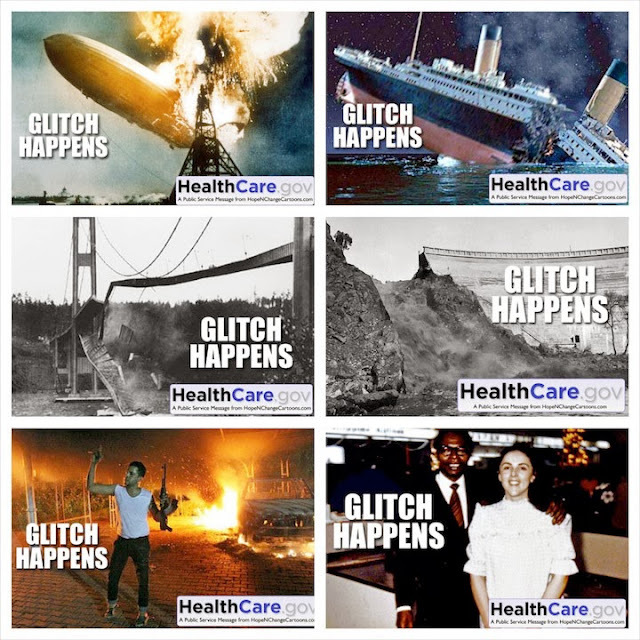 A little change of pace today; this is a partial collection of graphics which Hope n' Change created for Facebook (and our good friends at Barack Obama's Dead Fly) because we're fed up with hearing the word "glitch" applied to the Healthcare.gov website debacle. "Glitch" sounds small, cute, and sort of pleasantly quirky. But a "glitch" doesn't cost taxpayers hundreds of millions of dollars. A "glitch" doesn't cause human suffering or potential loss of life. A "glitch" is a minor mistake - not the inevitable result of botched human planning, shirked responsibility, and the decision to put a higher priority on politics than practicality. Rather, what we're seeing at Healthcare.gov should more properly be described as a "man-caused disaster," a term the Obama administration originally proposed as a euphemism for acts of terror. 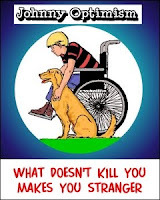 It's time to take that term out of the mothballs and put it back into everyday use. After all, we've paid for it. 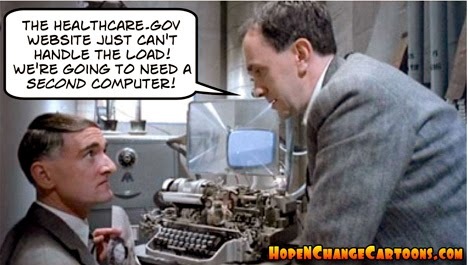 Healthcare.gov, the public face (or is that "farce?") 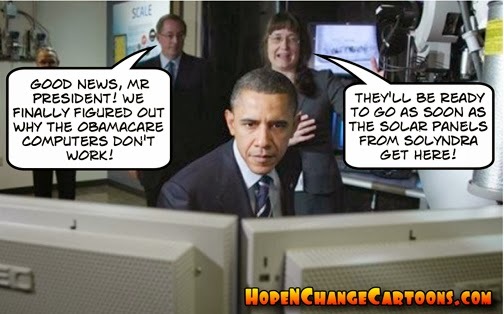 of Obamacare, is still no closer to functionality after three weeks of doing little more than delivering multi-million dollar error messages to the public. But now, borrowing language from the George W. Bush administration in hopes that somehow, eventually, they can blame this mess on him, Obama has declared a new "tech surge" on the Healthcare.gov website. Even now, computer programmers are descending from helicopters on ropes, and combing over pages of binary code through their night-vision goggles. Meanwhile, HHS Secretary Kathleen Sibelius finds herself in the increasingly blazing spotlight, being forced to put on a smiley face about the healthcare disaster she is directly responsible for. But General Sibelius isn't standing down (as many are now calling for). Rather, she's proclaimed "I called on the contractor to get its A-team here and give us 150%." In other words, she's demanding 50% more from her people than is logically, humanly, or mathematically possible. 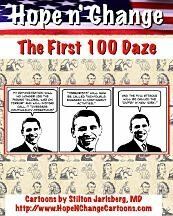 Which makes Hope n' Change wonder - how many of the other components of Obamacare are required to function at 150%, 500%, or a trillion-jillion% over what is actually possible? There is an increasing tide of news articles suggesting that the real problem with healthcare.gov (and the backend systems, if anyone ever gets that far) isn't so much the code or the contractors, but the inept government supervision which has demanded the impossible, based on requirements that are unintelligible, all of which is supervised by clueless, politically motivated bureaucrats. And inevitably, this disaster will result in human suffering and deaths. And maybe a copy of Windows which wasn't bootlegged.